It seems like in ear headphones are becoming more and more popular these days as technology increasingly makes them more viable, more comfortable, and with a high enough level of quality sound that rivals many full sized headphone predecessors. It’s easy to see the appeal for consumers: in ear headphones are more small and compact, can be worn discreetly, and most of them are noise isolating enough to keep your audio to yourself without bothering those around you. In ear headphones, also known as in ear monitors (“IEM’s“), earbuds, or sometimes earphones, seem to be the average persons preference when it comes to personal audio devices versus full sized headphones by a long shot. DJ’s, sound engineers, and other audio professionals will probably always prefer full sized headphones for their work, but some of the technology being utilized with the best in ear headphones these days might even change that! Klipsch decided to get into the in ear headphones game a few years ago, releasing the “S” line of in ear headphones in order to provide a high quality line of reasonably priced earbud headphones that would deliver a solid product with excellent sound, and they did just that! The Image S4′s are first and foremost very sturdy and comfortable at the same time. The earphones themselves are placed inside of what seems to be housing made primarily of plastic, and not the cheap kind either – it’s tough and durable enough to take some abuse, but has a soft elasticity to it that allows the individual earbuds to adjust to your ear canal without causing discomfort. This plastic construction makes them very lightweight, too, and the precisely angled nozzle on each earbud makes them extremely comfortable. Since not all ears are the same size, the Klipsch Image S4 headphones come with three different sizes of oval ear tips so that you’re able to find a size that fits precisely. After messing with my own for a while, I found that the medium suited me perfectly. These plastic ear tips are washable, too. The Klipsch IMAGE S4 in ear headphones have excellent sound quality, especially for such a reasonable price – many in ear headphones have issues isolating sound, and when they do the sound tends to become so boxy that it’s difficult to even enjoy. Cheap earbuds that come with your MP3 player tend to have this problem, but not so with the Klipsh S4′s – the specially designed oval tips create a sealed, noise isolating environment without any of these issues. Bass and low end frequencies are the Klipsch S4′s strongest aspect – it’s boomy, wide, and punchy enough to satisfy bassheads without being so strong that it would bother others. Despite the strong bass, it’s never muddy or distorted even at high volume, nor does it get in the way of mid or high range sound frequencies, both of which are very clear and crisp. A hard, metal carrying case also comes with the Klipsch Image S4′s which is great for portability! If you’re anything like myself you’ve probably broken a pair or two of cheap in ear headphones or earbuds by carrying them around in a pocket or backpack unprotected. The metal case (which is around the size of an Altoids tin) prevents this from happening and is small enough to fit right in your pocket. Shure has been a leading name in the audio equipment industry for years as well, and their proven track record of everything from microphones to full sized headphones was more than enough to give me confidence that Shure would make some of the best in ear headphones too. The Shure SE215′s are the entry level model in Shures “SE” line of in ear headphones which include three other models – the SE315s, SE425s, and SE535s. Sound quality for the Shure SE215′s is fantastic especially when it comes to bass response. Bass heads like myself will appreciate how powerful and punchy the low frequencies are, although they never muddle the highs and mids. Mid range and highs are slightly less pronounced than the bass, which certainly takes center stage among the frequency spectrum, although not enough to take away from their overall sound quality. Much like the Klipsch Image S4′s, the SE215s come with three different sizes of earbud sleeves so that you can get the perfect size for maximum comfort. The Shure SE215s actually come with two sets of three, however. One set of three is made from the standard silicone that come with most in ear headphones, but they actually include another set of three “foam” sleeves which act somewhat like memory foam. These memory foam earbud sleeves eventually begin to conform to the shape of your ears, resulting in an even more comfortable fit. Sound isolation is top notch with the Shure SE215s as well. Once you determine which size of sleeve is best for you, you can achieve a sealed fit that seals in and out just about all sound – Shure actually ensures that up to 37 decibels of external noise can be completely cancelled out! This is due to Shuresvery specific angle/shape of the earbud nozzle as to fit comfortably yet snugly into your ear, which differs from the standard round shape which often falls out during movement or barely isolates sound. Durability is a big issue with many of these sort of headphones as well. Even some of the best in ear headphones are prone to damage from constant pulling on cords, tossing them and pulling them in and out of bags, etc. Thankfully this issue is practically nonexistent with the Shure SE215′s! The 64 inch long cable is not only detachable, but is also reinforced with kevlar – the same material used to make bulletproof vests! The Shure 215′s also come with a nylon carrying case which isn’t quite as great as a metal or hard case, but is far better than leaving them loose in your pocket or a bag. The Thinksound TS02 in ear headphones are some of the more unique headphones we’ve seen yet. 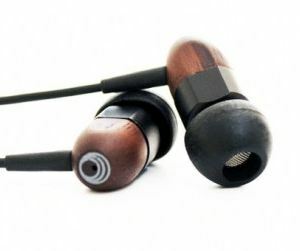 Designed with the idea of producing an environmentally friendly set of in ear headphones, the Thinksound TS02 earphones are made from renewable wood sources versus the standard plastic or metal parts. Doing well by the environment is always a great cause, but does this difference make a have a negative or positive effect on the sound quality? As a matter of fact, it seems like it does – thankfully that effect is positive! The Thinksound TS02′s have an excellent, all around high quality sound to them. It might sound cliche seeing as they’re made of wood, but the Thinksound TS02′sdefinitely have a warm, natural sound stage. Bass is slightly emphasized over the mids and highs, but the emphasis is so light that I have to believe it’s only present due to the fact that most consumers these days want a little extra punch when it comes to the bass, which is exactly what you’ll get with these. The sound stage, like I said, definitely has plenty of width. It’s not entirely three dimensional like an expensive pair of over the ear headphones can provide, but the sound in general feels, again, very natural. The Thinksound TS02′s come with not just three, but FOUR different sizes of earbud sleeves so as to make absolutely certain that you can achieve a comfortable fit that’s going to seal sound in as best as it can. The Thinksound TS02′s do very well here, too – you’re not going to cancel out any and all external noise with these, but for the most part you have to have the volume down pretty low in order to hear anything that isn’t directly in front of you. That goes for sound leaking out, as well – someone would have to really be trying and be within very close proximity to you in order to hear what you’re listening to. As a nice added bonus, the Thinksound TS02′s come with a built in microphone too – this offers the ability to use them with your Android or Iphone for phone calls!